I wish he had used weight rather than volume measurements! Dang, eight cups of flour is a lot. This better be worth it. Hot water during autolyse? Weird… ok. (five minutes later) Oh no, he said “use warm, not hot water”! Oops. This thing is really gummy. Will I be able to save it? I would hate to waste eight cups of flour. Maybe I can stretch and fold this thing into service. Oh no, I forgot the salt (desperately tries to knead it in). Oh no, I forgot the oil (pours it on the dough and kneads it in). Oops, it was just supposed to grease the proofing bowl. What is going on with me today? 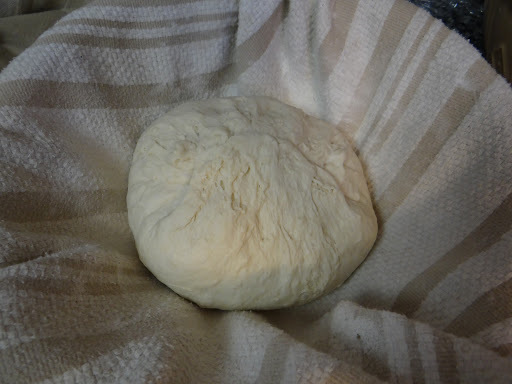 Ok, putting the dough into the couche now… oh no, I was supposed to do a short bulk fermentation in the refrigerator (desperately wraps couche in plastic wrap and puts in the refrigerator). Looking good, time to put in the oven… um, Mr. Bread Maiden, when does your sauerkraut come out of the oven? FIVE MORE HOURS???? Time to score … and the razor blade falls into the dutch oven. Great. Out of the oven – it looks beautiful! My FIL trying a piece: this needs salt. Adding warm, not hot water. And it looks like it’s supposed to! (phew). Nice and stretchy, not gummy. Doing well. Added everything at the right time. Decided I like the oil in the dough anyway. Improves preservation. Proofing going well. I’m liking the couche method for the final rise. It does seem to help the bread get a crust and keep a nice shape instead of flattening out during the final rise. I imagine it is even more important for high hydration doughs. Will have to do more investigation. Turned out my dough from its couche into the hot dutch oven. Miscalculated and it landed along the side of the dutch oven. Had to shake the dutch oven to even it out. Tried to use a serrated knife instead of a razor blade, which was much tougher. Can’t pull the knife quickly at the necessary angle to score well. I’ll have to pick up some razor blades for next week. Crusty crust, like last time. The top looks beautiful despite the snags. This recipe does need more salt. And bigger holes. Ok fine, Preston Yancey. I’ll invest in some razor blades for a pretty scoring pattern. It’s just a matter of time before I burn myself trying to do it with a serrated knife. I swear I read the recipe each time, and each time I make a mistake. What is the matter with me? This is ridiculous. When did the recipe call for the couches to be in the refrigerator for the final rise? I’d like to see how this recipe does with baguettes. What would I have to do to modify it? I’m going to make these into baguettes! Ugh, I don’t have enough white flour! Whole wheat it is then. I’ll have to make sure the gluten formation is really strong for baguettes. First time using a couche for baguettes. Ugh, I forgot the salt. Again. What is wrong with me? 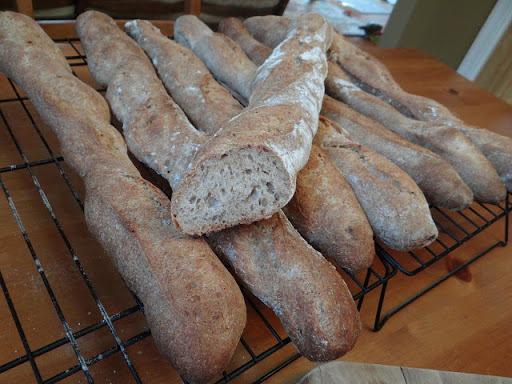 These shape into baguettes really well! But how am I going to bake them to get good oven spring? Baking sheet saves the day! Wow, I’m really impressed with how these turned out. I bet they would be even better with all white flour. Pretty happy this week! 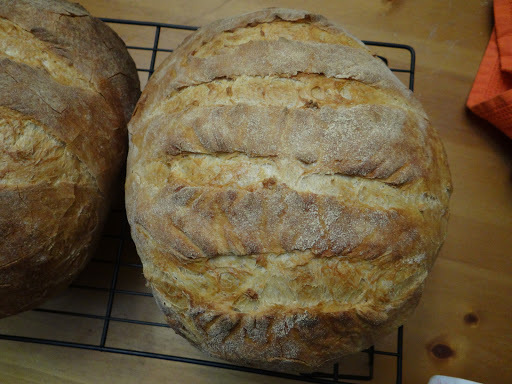 I even decided to invest in two bannetons because I am totally sold now on using a couche for the second rise. What I’m not sold on? Grinding the salt. It makes no sense. I mean, I guess as far as mindless activities go it’s not the worst, but I don’t have the time for mindless activities. Even Mr. Bread Maiden gave me a skeptical look when I told him what I was doing. 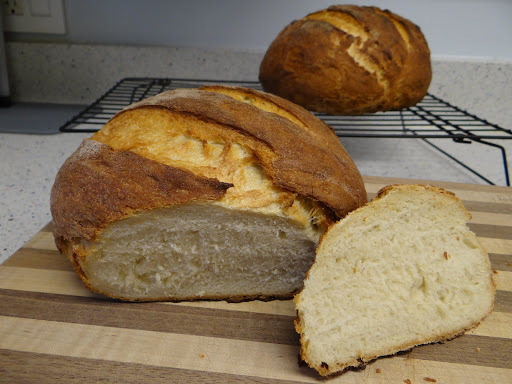 That said, actually adding salt to the bread (unlike several weeks where I forgot it) made it much tastier. Not sure if it needed to be freshly ground though. Yippee, it’s week 5! Almost done with the nine weeks of Preston Yancey’s white bread! This week, I made a sincere attempt to follow Preston’s recipe, so I didn’t use any of the hacks I detailed in week 3. So the holes in the crumb were back to being small. Maybe next week. 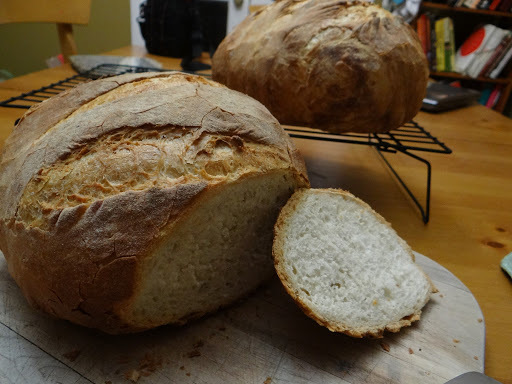 One modification I did make though, from week 3 to week 5, was decrease the amount of flour from 1260 to 1150 grams in an effort to bump up the hydration a little. I remembered to use Preston’s lidded container trick for the yeast mixture! First time trying out the bannetons! Aaaand… they stick a bit. Going to use more rye flour next time. I find myself wondering if Preston has adjusted his baking at all since having a kid. It sounds awful but I feel like the kinds of things detailed in his recipe (grinding the salt, having a short rise instead of a long one, etc. are things that are difficult to do when you have a baby. At least, they have been for me. So many of my bread hacks are to weave flexibility into the process. But who knows. He is a writer, so he likely works from home and has the time to wait for bread to rise on its own schedule. I remembered the salt! But this dough is way too wet. 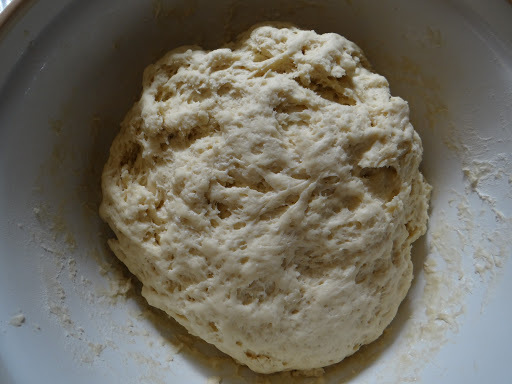 With all the things I remembered this time, somehow I forgot how much bread this dough makes! Thankfully Mr. Bread Maiden and I have discovered 2-gallon storage bags, which are big enough to fit one loaf of this bread (or several half-eaten loaves). Wow, I’m really making this bread my own. 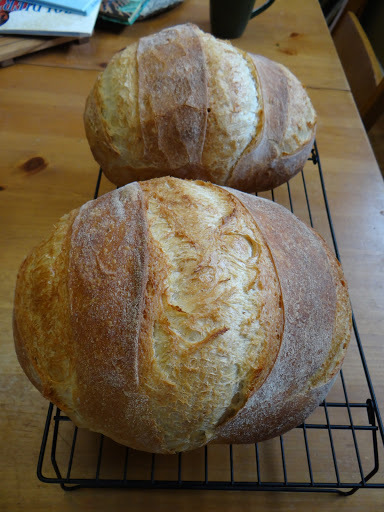 This week I kept increasing the hydration of the dough, and remembered to divide it into three loaves this time. Forgot the oil but it’s not needed. I also remembered to proof the yeast in a lidded tupperware so that I could shake it up, but I don’t know if it’s a necessary step so I’ll probably skip it when I’m done with this baking project. This week was a disaster. Woohoo! I’m finally done with this challenge! I cut the hydration down from 78% to 71%, and it did seem to work better this time as far as handling and shaping the loaves. I thought my parents had a dutch oven so I didn’t bring one over to their house and ended up having to use a baking sheet and pyrex dish to bake these. They ended up a little flat but otherwise perfect. And that’s it! 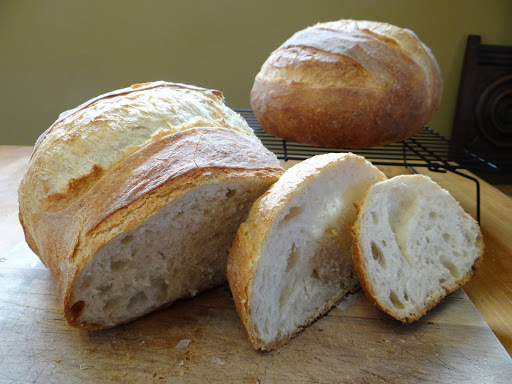 Nine weeks of bread in one post.